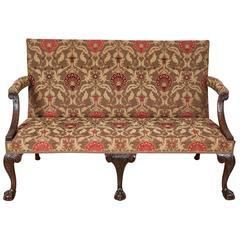 An extremely rare George II mahogany settee with needlepoint upholstery. 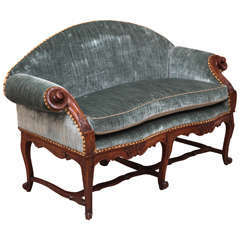 The padded back and seat within open arms featuring scrolled lion masks, the whole raised on foliate carved cabriole legs ending in claw-and-ball feet and casters. The needlepoint upholstery depicting figures within decorative oval cartouches. Provenance Richard Courtney Ltd., London, 1995 Private Collection, USA. A very fine George II Irish mahogany armchair. The serpentine top rail with central scallop shell cresting above a pierced and interlaced carved back splat. 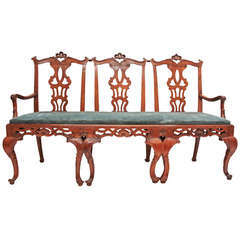 A George II period mahogany settee having carved legs terminating in claw and ball feet. 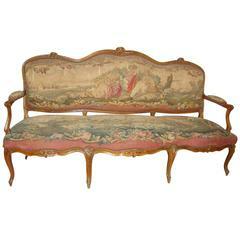 18th century French Regence walnut settee finely carved with scrolled arms. 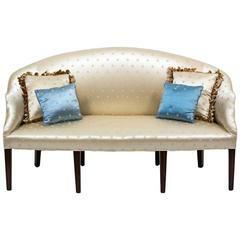 The settee is covered in silk velvet fabric.